THUNDER BAY, ON — The Semi Final matchup for the Gridlink Atom Queens would be a rematch against the Westfort Maroons who the queens had previous lost to in the round robin by a score of 7-1. Olivia Vinet got the Queens off to a great start, scoring midway through the first period and then scoring a buzzer-beater with just one second remaining in the period! Goalie Allie Attema came up big on a couple of penalty kills in the second period, retaining the 2-goal advantage. The Maroons pushed in the third to get back into the game but Maddy Arthur would get the puck to Grace Dorey who’d score late in the game, easily putting the game out of reach. Attema completed the shutout as the Queens took a 3-0 victory and punched their ticket to the Championship game. That afternoon, the Queens faced the KC Whalers in the Finals. The Whalers harpooned an early lead scoring in the first and second to take a two-to-zip lead. The Queens responded on a goal from Sophia Campagna, cutting the lead to one before the third. The Atoms, though, couldn't find an equalizer as the KC Whalers managed to pop in one more and take a 3-1 win and the Gold. 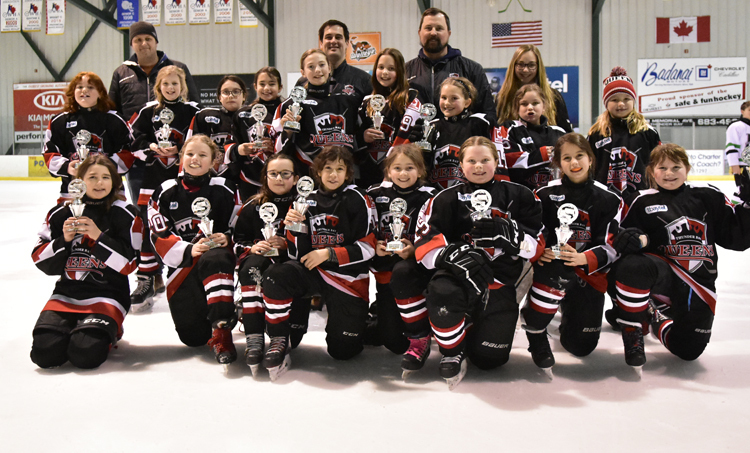 The Gridlink Atom Queens though had a great time and a great showing as this was the 5th tournament where they've metalled (gold, 3 silvers and a bronze) this season.